Categories: Lawn & Patio, Amazon_Dealz. 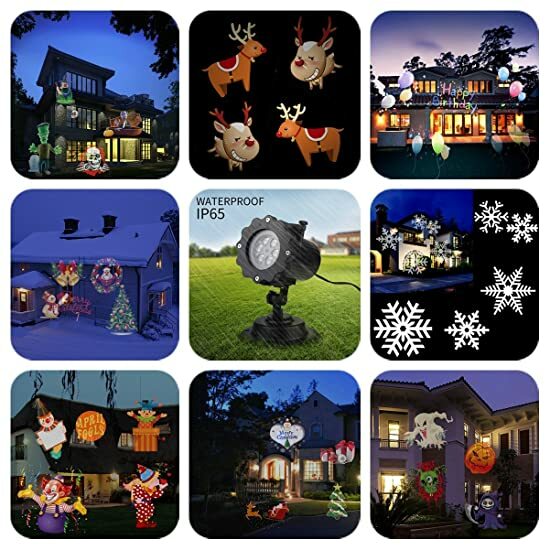 - This Projector lights is up to 16 Pattern Sildes,Perfect for Christmas decoration,The pattern LED moving landscape spotilghts,pumkin,ghost,santa,star shower,snowflake and many pictures,suitable for house indoor or outdoor. 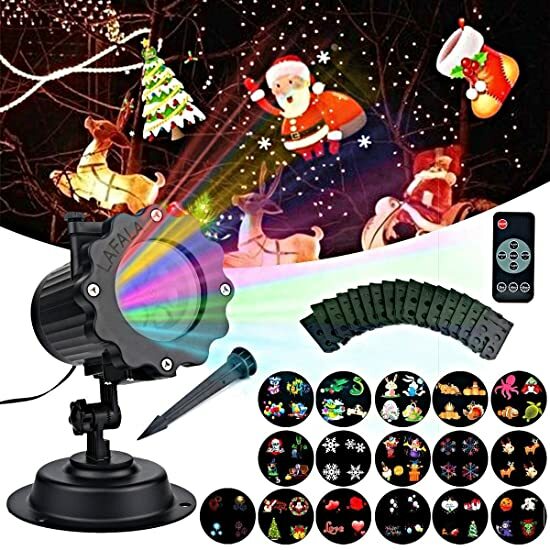 - Christmas Decoration Lights Projector Designs for every occasion!It will made your house unique and super cool on Christmas.Your children will very like it and feel happy.Give you a beautiful family time. 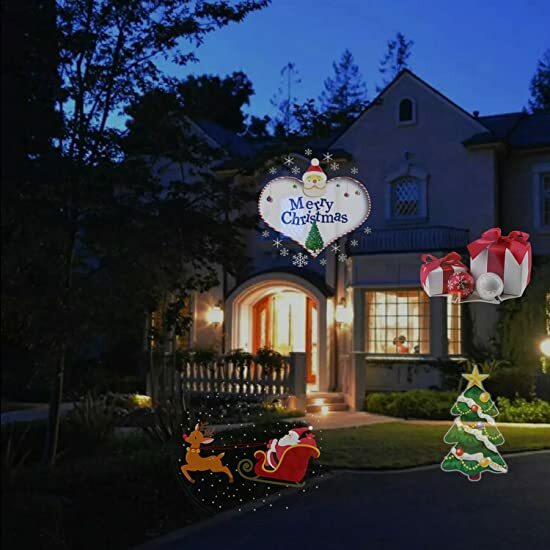 - Easy installation and use it,you can plug in and place it on the ground,or install it on the wall with the round base.Plug in, turn on, and watch your garden or house be instantly saturated in gorgeous multicolor lights. 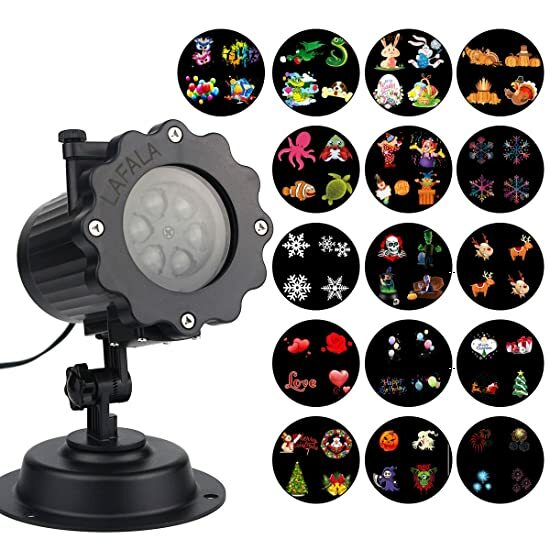 Perfect for creating a festival atmosphere.Just set up this light and pattern projector in your garden. -If there is any quality problem,please feel free to contact us.We will offer replacement or refund service. Note:Best time for using is 6 hours per day,so the machine with 6 hours automatic shutdown function,that is,work 6 hours,shut down for 18 hours. 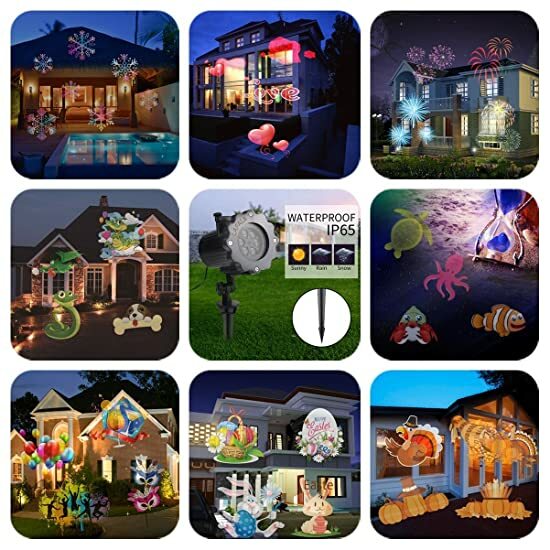 Newest picture for Christmas projector lights -up to 16 pattern sliders, each of them is exclusive designed including Easter theme, Halloween ghost,Romantic balloon,love wedding,white snowflake,etc.Suitable for wall and garden decoration.The light power promotes to 6 w instead of 4 w, which make the illumination brighter. High Quality & User-friendly design-the projector lamp is made by waterproof material for indoor and outdoor.No more worry about raining or snowy weather.The projection distance is about 8-10 meters and the largest area of projection is about 30 square meters. With a upgrade version, this new projector can control by a remoter. 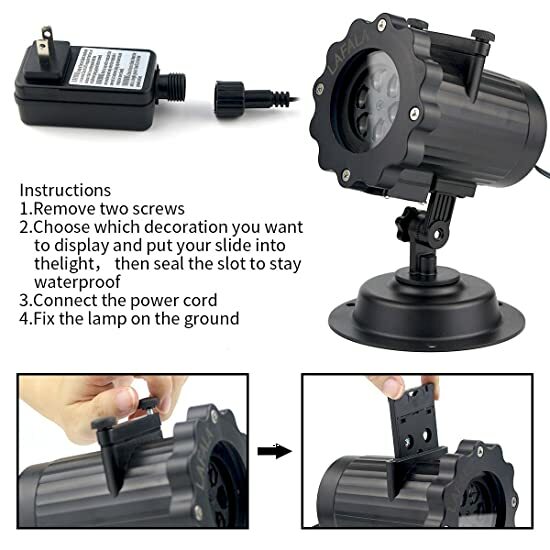 You can control the lamp such as set a timer, adjust the flashing speed and turn on or off in a distance,which make the operation easier. 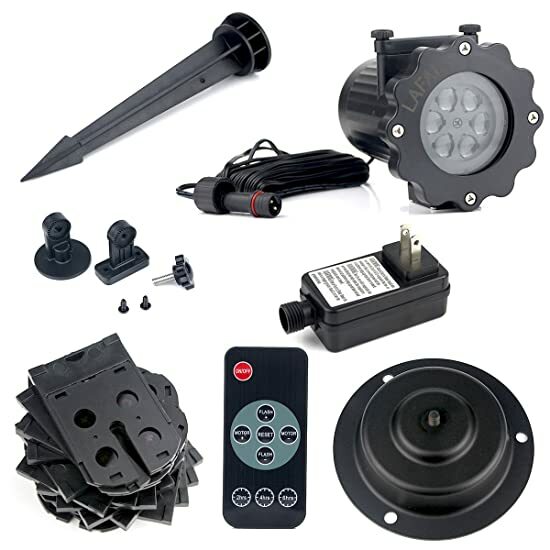 Convenient to install-It comes with a round base and a long ground stake so it can be either stake in the grass or put in indoor.With a 16 ft long cable wire that is long enough to adjust the projector position in your garden to get the best result. 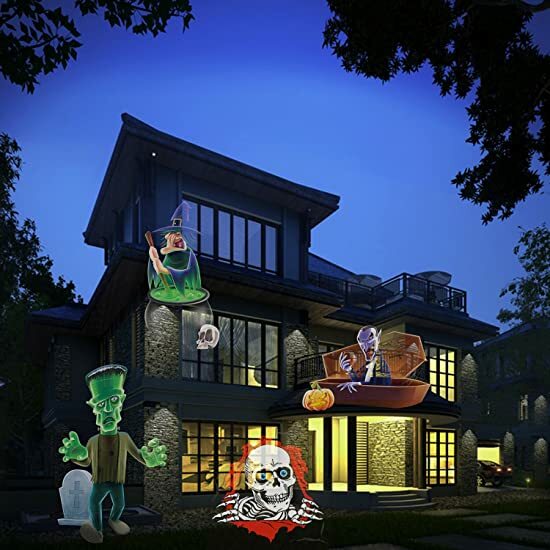 Widely used in various occasions-The rotatable projector can make the pattern move dazzlingly, which can create festival atmospheres like in wedding ceremony, Halloween party, theme party,home party,banquet,holiday,carnival,etc.Giving the great joy and fun to children and adults. warning and customer service- the projector is installed with a thermostatic device inside. Please avoid using the projector over temperature 45℃ constantly. Once the temperature of the apparatus is above 60℃,the film will melt.There is also installed with a device of motor fan that can help to dissipate the heat.If there is any quality problem,please feel free to contact us.We will offer replacement or refund service.